"Microsoft to developers: Metro is your future"
Silverlight and .Net are not dead (yet). 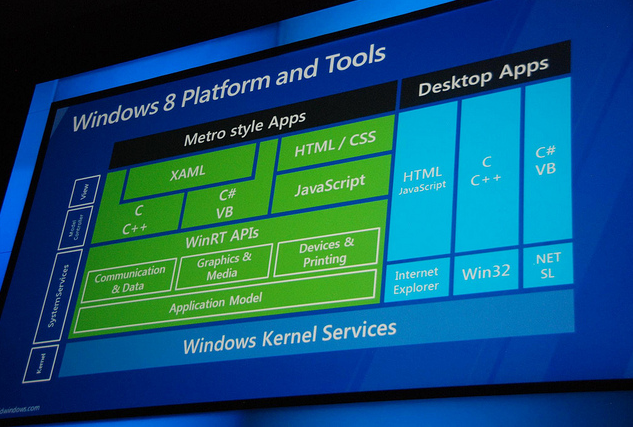 But Metro is really the future for Windows8, Microsoft is telling developers on the opening day of Build. "Metro” is the name of the design language that Microsoft pioneered with Windows Phone 7 "
This technology gave users an option to down the a Windows Desktop Update that allowed then to bind HTML content to the desktop in the form of a wallpaper replacement and desktop items that were synchronized automatically when connected to the web. The second class of applications that can be built and run on Windows 8 PCs and tablets is called “Desktop” applications. These are applications that users can access by clicking on the Desktop tile in Windows 8. They don’t have to be immersive; they can look and feel like classic Windows applications that don’t assume that users will want/need to rely on touch as the primary way that they interact with them. Examples of existing Desktop apps that will work on Windows 8 are things like Photoshop or Intuit. Microsoft’s execs are emphasizing that Windows 8 is a no-compromise platform. They are positioning it as an operating system that can be all things to all people. But make no mistake: Microsoft sees Metro Style apps as the future.